A very quick and interesting entry which stems from the very last issue of Your Commodore magazine (Better known as YC issue 84). 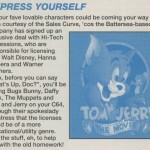 In the news section, it was stated that Sales Curve had signed up an exclusive deal with Hi-Tech Expressions to do various educational titles based on Bugs Bunny, Daffy Duck, The Muppets and Tom and Jerry. Slightly ironic that there was a Daffy Duck game by Hi-Tech Expressions you might think, but it is not to be confused with the Hi-Tec Software company from the UK. Hi-Tech Expressions was a US based software company. Although the C64 titles don’t seem to have ever surfaced, a Daffy Duck game did surface on the PC. Not sure as of yet if therefore the C64 link was just made up vapourware by YC magazine – which has to be said was a terrible magazine and hard to judge if much was serious in it. But here is an entry any way until we find out more!